"One Particular Harbor” can comfortably sleep up to 10/11, with 3 bedrooms and 2 full baths upstairs, along with a sleeper sofa. The master bedroom has a king-size bed; the second bedroom has a full-size bed and a twin bed and the third bedroom has a queen-size bed. The downstairs area has a bedroom (sleeps 2) and a half bath. All bedrooms have Smart TVs as does the large family room (55” TV). The property is located on the east side of OIB on a canal street. Your family will undoubtedly enjoy fishing or kayaking (available for rent at nearby shops) in the canal or just relaxing on the large dock looking out over the water. In addition, you’ll love the view from the upstairs dock overlooking the canal or enjoying cold beverages and a game of Giant Jenga in the shade at the outside “One Particular Harbor Tiki Bar”! If you wish to avoid a lot of driving once you arrive at your vacation destination, “One Particular Harbor” is definitely the place for your family. You will be within a five to ten-minute walk to the center of the island, which includes the concert pavilion, playground, museum, miniature golf, restaurants and bars, coffee shop, wine shop, fishing pier, ice cream shops, beach shops and more! AND of course, most importantly, you will be within a 5-minute walk of the beach! YES…. 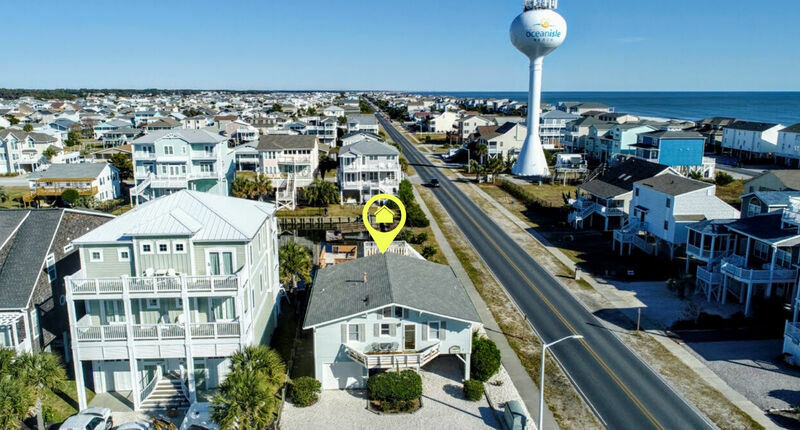 you can have your toes in the sand within 5 minutes, as the property sits only one block from the ocean at the OIB Community Center beach access! The updated kitchen will be well-equipped including beautiful new cabinetry, stainless-steel appliances, coffee bar and much more. The spacious dining area can accommodate large family dinners, game nights and more with additional seating available at the kitchen island. A charcoal grill is provided for outdoor cooking. A washer and dyer are located adjacent to the kitchen along with iron and ironing board.